The Bank of England wants European authorities to provide assurance that contracts worth 100 trillion pounds will be valid after Brexit. The EU’s watchdog says banks must prepare for the worst. Playing politics with financial stability bodes ill for future regulatory cooperation. The opposition Labour party wants the Bank of England to include productivity targets in its mandate. The idea seems flawed - monetary policy is a weak tool for boosting efficiency. But it reflects a growing political dissatisfaction with independent yet impotent central banks. UK inflation is high enough for the Bank of England boss to further tighten policy in a couple of months but not so high as to hurt consumer demand, especially as wages are picking up. And Brexit poses less of an immediate danger. Politics and economics are both on Carney’s side. 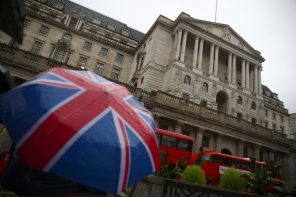 Bank of England Chief Economist Andy Haldane says rate-setters should speak simply and honestly to the public. The first is easier than the second. Admitting past mistakes or doubts about the present is tough for institutions whose clout depends on an aura of omnipotence. Between taming inflation, fighting the financial crisis and averting a breakup of the euro, monetary policymakers acquired an aura of omnipotence. Their responsibilities are growing and their mandates have turned into a fetish. A painful collision with reality is overdue. Fed Chair Janet Yellen showed rate-setters can shock markets even when they stick to the script. That’s a lesson for the Bank of England’s Mark Carney, who has talked up a rate rise this year. Like her, he may have to hike without having solved a host of economic puzzles. Regulators worry that the growth of open-ended bond funds could cause fire sales. A central bank paper estimates that could add nearly half a percentage point to companies’ funding costs. Pointy-headed analysis should reinforce the case for more sensible investment models. The central bank underlined its determination to keep 10-year yields close to zero by offering to buy unlimited bonds. The BOJ has the tools, market dominance and motivation to hold firm. Tighter policy in the West should help Japan by weakening the yen and importing inflation.